Muthaland at 16th Street Theater is a one woman show written and performed by the talented Minita Gandhi. It’s a showcase for her dexterity and ability to create and inhabit characters we love, and characters who make our skin crawl, as she goes on a journey to her parents homeland. In 16th Street’s bare black box theatre, there is only one practical light onstage, and the rest of the show travels on in the darkness with Minita herself. She walks down the staircase through the audience carrying her suitcases to the practical standing lamp on stage. Little did we know she was carrying the world of the play in her arms. The opening of Minita Gandhi’s Muthaland is an energy-packed celebration of femininity and personality. She animatedly tells us about her life, her hopes for love and her family drama, which includes the upcoming wedding of her dear brother Milin. Minita separates herself as narrator by giving herself the affectionate nickname of Minu when she’s playing in a scene from history. 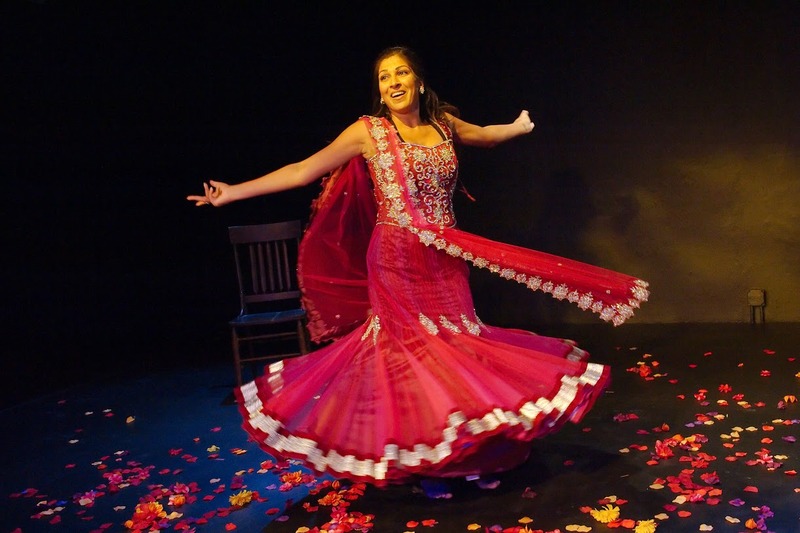 Minu is an independent woman, the daughter of two Indian immigrants who are audience favorites for Minita to affectionately and sometimes comedically interpret onstage. She is 35 years old, and has been getting her groove back by listening to Pink and Fiona Apple, reading The Power of Now and taking a Pranayama breathing class. After a visit to a gynecologist, Minu learns she only has two years to get a husband and have babies before she has to be concerned about freezing her eggs, and this is a terrifying enough thought that she returns to her prayer cabinet. Minu is a practicing Jain, which at more 85,000 years old is the one of the world’s oldest religions. She recites the Namokar mantra, one of the most fundamental and spiritually significant prayers in Jainism. This moment of gravitas is our first insight into bubbly actress Minu’s depth of intention and spiritual practice. Though dramatically this is very clever, sometimes Minita playing an earlier, more innocent Minu is hard to buy. At the end of the production, when a you see a grown Minita in her mature fury and might, you understand why this character, that is so very personal and so profoundly changed in real life, might be harder for Minita to access than the multitude of personalities she brings to life onstage. These other characters are defined very specifically through gesture and voice, and it is clear who is speaking at any given time. Minita the writer gives us access to the finer points in her life and family’s traditional customs in a delicate way that allows us to laugh at Minu’s reactions without laughing at cultural differences – which can often happen if an audience doesn’t understand something outright. Milin for example is in an arranged marriage, something Minu has a really hard time understanding at first, but once she sees how happy he is the audience is happy for him too. So, Minu is off to India, in one of the most fantastic visual moments of the play. Contained in her tiny suitcase is truly the entire world, as she pulls out costumes and scatters the stage with color as the lights (designed by Cat Wilson) flood the world with a pink and orange hue, transforming the black walls. You can feel the heat and the dust as Minu describes it to us thanks to the vivid text and suggestive design visuals. The sound also helps us understand our cultural context, as a variety of American and Bollywood love songs are played throughout the piece. Muthaland is based off of Minita’s true experiences during her travels to India, and I do not want to spoil the surprise that is the crux of the drama in this play. I will speak to her magnificent performance of these gravity-filled moments. During a scene I will refer to as “The Interrogation” she masterfully plays a council of older Indian men who are questioning her honesty with a misogyny that will make your toes curl. Legs spread wide in a single spotlight, Minita easily embodies the threat and danger of these men as a steady heart-beat like pulse (sound by Barry Bennett) underscores their words. It conjures visceral memories of femmes being accused of lying when under threat from men, and is very hard to watch though artfully portrayed. The experience is so awful, that when it is over, it prompts Minu to tell her parents she hates India – thankfully only a temporary conclusion. Muthaland is about the forcible growth of an already strong young woman, who was forced to undergo an emotionally and physically violent experience yet still reconcile her identity. In a spectacular final ten minutes of the play, Gandhi goes on an emotional journey from absolute devastation to a realistic healing process, perhaps even slightly optimistic about what is in her future. I commend Minita for her stamina in performing in this fabulous 90-minute production of her own work, and I can’t wait to see what productions lie in its future. BIAS ALERT: Minita Gandhi is a friend.